This looks like it would be a great fit! You had me at "Co-op Multiplayer VR Experience"
**** take my money, this is all I've ever wanted, seriously. A VR Gauntlet type game. Has anyone with the Omni bought this yet? @DanteM my Omni is scheduled for delivery tomorrow so keep me in the loop. Dev's aren't interested in the Omni at all. "We're grateful for the helping hand, but this is not something we'll be focusing on at the present time. If the demand rises, then yes. If not, ask us closer to full release." @DanteM This dev has not yet been informed about how he can monetize his game in our commercial channel. Most devs are very interested in working with us. We have many more games on the way to be announced in due time. Does anyone have contact info for Vanishing Realms? @Admin At first I scoffed, and then turned to google for your answer... google has failed me. I swear he has no public contact information and his 'website' has nothing either.. The only alternative I see is posting on the forums and waiting for a response. http://steamcommunity.com/id/indimolabs add them and message them on steam that's how I get a hold of most of the dev's is through steam. Make a thread in the discussion section for their game + friend request it works almost everytime. Vanishing Realms hasn't really ever interested me so I never tried to contact them myself yet. Hope that changes their mind cause this game would be sick with Omni support... I'm not convinced it'll help though some of the dev's seem to dislike the contract one in particular was very unhappy about it haha. Been trying to convince dev's to implement support so that we have more than 3 games with support haha. I think the only real dev with current support is VRZ Torment so far but I could be wrong, been outta the loop for a few weeks due to surgery. It's exciting that Arizona Sunshine is getting it soon too WOO!!! but they haven't implemented it just yet sadly, but in the works . Delevoper: this is not something we'll be focusing on at the present time. If the demand rises, then yes. If not, ask us closer to full release. Thanks to your diligence both on the Karnage and the Omni forums we are now in talks with Virtuix regarding integration of their SDK. At this point we cannot provide any timeline, and are likely to start off with unofficial support only in order to gather feedback from you Omni pros, before moving into a more official support role. Happy? We are thrilled about it ourselves and will keep you updated on the progress! Please continue to send us names of other games for which you think the Omni would be a great fit! Awesome support on that thread @RABID , @Xain , and @sutekiB ^.^ not sure who L3ThAlSh0T is but woot to them as well. The "Align Omni" function has been added to Controller Options (find it through opening the Journal). Oh man, I can't wait to get home and try it. Has anyone had a chance to try it yet? Yeah, same here. I tried it and I couldn't even get the normal walking to work. i let the devs know they are walking on it. I've been doing testing with them and working directly with the company they have it almost fully working. I have some videos of it working really well. They also got their Omni 2 weeks ago so they should have support fully working soon. Video of the most recent test session. For some reason it works fine w Omni till I do some teleports. Then it messes w directions. When I run Omni fwd it moves me to the right. And this effect worsens with every teleport. Menu option to Align Omni does not change anything. Anyone else has same problem? First of all, thank you to the community for your patience and help with Karnage Chronicles on the Virtuix Omni! 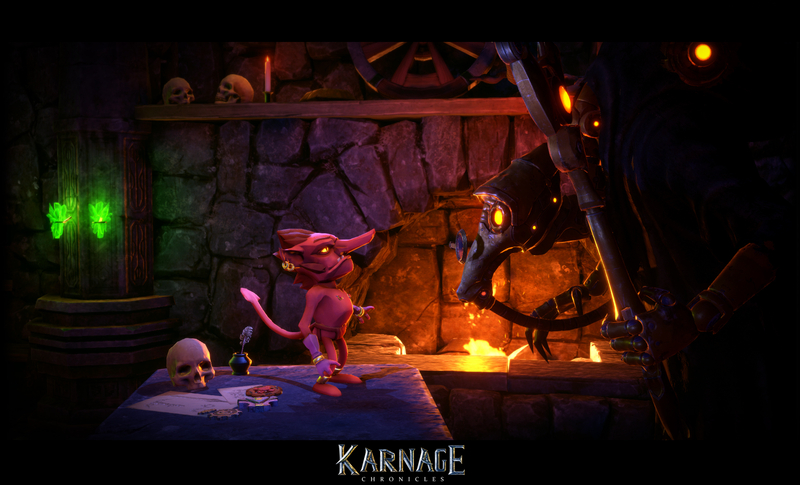 We have just released our new content update, which adds extensive content to Karnage, and today we released a patch so the Omni users can enjoy it! We are still in early access, so please be sure to let us know if there are any issues. Right now you may come across a few objects on the floor (coins and gems, nothing game breaking) that may be a little hard to reach. We are working on a solution for this, but as a small indie developer it may take time! We're really looking forward to your feedback, and we hope you enjoy Karnage Chronicles in full locomotion with the Virtuix Omni! Purchased! Not only supporting the Omni, but also read some good things about it on the VR reddits. Thanks for supporting the Omni! Please let us know if you encounter any issues! This IS great news!! Thank you for believing like I do. @escknx let us know if this patch fixes everything, and update to the latest firmware! Updated trailer for you guys!